Operative procedures of the skull base are relatively recent developments within the field of head and neck surgery. Over the past 20 years, advances in anesthesia, improvements in surgical technology, and refinements in reconstructive modalities have enabled surgical removal of cranial base tumors that were previously associated with unacceptable morbidity. A variety of benign tumors occur along the cranial base. The mainstay of treatment is surgical excision. Radiation therapy may be useful in nonoperative candidates or as adjuvant treatment in select cases. Because of the complexities of the anatomic region and the relatively low incidence, patients with skull base tumors are best managed by an experienced multidisciplinary team. As a whole, tumors of the skull base are uncommon entities, and the majority of them are malignant. Accordingly, no accurate data regarding the incidence of benign skull base neoplasms are available. Benign skull base tumors can be classified into the pathogenetic and histologic groups listed below. A brief pathologic description of the more common tumor types aids comprehension of the treatment strategies used to manage benign masses of the skull base. During embryonic development, a midline opening is present in the developing skull base in the basal frontal region known as the foramen cecum. Dural projections frequently protrude through the foramen cecum and come near the ectoderm of the developing nose. Normally these projections are resorbed during subsequent obliteration of the foraminal tract. Incomplete obliteration results in entrapped epithelial elements or vestigial dural tissue and primitive neurogenic elements. Proliferation of entrapped epithelium produces a nasal dermoid, which exists as epithelial-lined sacs containing adnexal tissue. In most cases, a sinus tract connects the cystic mass to the skin surface in the midline, and the opening can be found anywhere from the nasion to the columella. Simple dermoids involve only the skin and nasal bones, whereas complex dermoids have tracts that extend through the cribriform plate to involve the dura. Nasal gliomas have an etiogenesis similar to that of nasal dermoids but consist of a solid mass of glial tissue connected to the dura via a fibrous stalk that passes through a bony defect in the region of the foramen cecum. Nasal gliomas result from proliferation of residual dural tissue and neurogenic elements within the foramen cecum. Unlike nasal dermoids, they do not have a communication with the skin. Treatment is surgical removal similar to the removal used for complex nasal dermoids. During embryonic development of the skull base, bony defects may result, which can lead to herniation of CNS elements. Meningoceles contain meninges, whereas meningoencephaloceles contain both dura and brain tissue. Sincipital cephaloceles manifest externally in the region of the nasal root (nasofrontal, nasoethmoidal, nasoorbital), and the frontobasilar bony defect is anterior to the cribriform plate in the region of the foramen cecum. Basal cephaloceles manifest internally with the skull base defect located in the floor of the anterior fossa between the cribriform plate and the anterior clinoid process or through the superior orbital fissure. Treatment involves reduction of any herniated brain tissue where possible, surgical resection of protruding dura, closure of dural defects, and osseous repair of bony defects. Arachnoid cysts are thin-walled sacs containing entrapped cerebrospinal fluid (CSF). The cyst wall is formed by compressed layers of collagenous connective tissue lined by a flattened hyperplastic arachnoid. These are rare lesions and tend to occur in the petrous pyramid. Treatment is only necessary if they are symptomatic. Surgical drainage through a retrolabyrinthine exposure with preservation of hearing is the recommended management. Total removal is not mandatory, and an attempt at hearing preservation should be possible in virtually all cases. Primary cholesteatomas arise from epithelial rests within the temporal bone or cerebellopontine angle. They are slow-growing masses filled with keratin debris and usually manifest with cranial nerve (CN) or auditory system findings due to compression of adjacent CNs and temporal bone structures. Complete surgical removal is recommended. These masses arise in the pneumatized areas of the temporal bone. Predisposing factors include hemorrhage into the air cells, foreign body reaction, and progressive granuloma formation with occlusion of the air cell system. Total excision is unnecessary, and drainage may be achieved by an infralabyrinthine or other suitable approaches with preservation of CN function. Obstruction of mucociliary drainage from the paranasal sinuses can lead to expansile mucoceles capable of progressive growth and bony distortion. Maxillofacial trauma is the most common predisposing factor. Lesions of the frontal and ethmoid sinuses involve the skull base. Marsupialization and surgical restoration of adequate sinonasal drainage are necessary. Also known as pleomorphic adenoma, these tumors arise from minor salivary gland nests located within the nasal cavity, paranasal sinuses, nasopharynx, and paranasopharyngeal space. Histologically, they contain multiple neoplastic tissue types, including both epithelial (glandular) and mesenchymal (collagenous) components. Although pleomorphic adenomas are the most common tumors of the major salivary glands, they are less common than malignant salivary neoplasms within other sites of the aerodigestive tract. Pleomorphic adenomas do not metastasize but demonstrate variable rates of local growth. These adenomas have a fibrous capsule, but the surface is somewhat irregular, and they possess pseudopod extensions along their surface. Therefore, local recurrence following removal can be a problem if an inadequate margin of surrounding tissue is taken. A very small chance of malignant transformation has been reported. The recommended treatment of choice is surgical excision, although small relatively slow-growing tumors without local symptoms can be observed with periodic monitoring. Papillomas of the sinonasal tract arise from squamous or schneiderian epithelium. They can be grouped into inverting, fungiform, and cylindrical subtypes (based on histologic architecture). Inverting papillomas, also known as schneiderian papilloma, originate in the lateral nasal wall, antrum, and ethmoid sinus. They involve the skull base more commonly than other types of nasal papilloma, demonstrating progressive local growth with a significant risk of malignant transformation (15%). Treatment is complete surgical en bloc resection because piecemeal removal is associated with an unacceptable recurrence rate (50%). Radiation therapy is believed to stimulate cancerous changes. The Rathke pouch is an invagination of nasopharyngeal epithelium in the posterior midline, from which the anterior pituitary gland develops during fetal life. Remnants of the Rathke pouch may persist, from which cysts or tumors can form. Tumors are known as craniopharyngioma, and they tend to grow in a cranial direction toward the sella and pituitary gland. This group of lesions encompasses fibrous dysplasia and ossifying fibroma. Giant cell lesions (eg, reparative giant cell granuloma, giant cell tumor of bone) can also be considered fibro-osseous lesions. Fibrous dysplasia is a hamartomatous process characterized by proliferation of immature woven bone. Monostotic and polyostotic forms can be found, depending on single or multiple site involvement. Growth typically progresses through puberty and then slows or stops at the time of skeletal maturity. Lesions can reach considerable size with associated disfigurement, and symptoms are related to gradual encroachment on vital structures (eg, orbit, optic nerve, frontonasal duct). Ossifying fibroma is a true neoplasm and can be difficult to distinguish histologically from fibrous dysplasia. These fibromas tend to behave more aggressively than fibrous dysplasia, can exhibit very rapid growth, and continue growing if left untreated. Juvenile ossifying fibroma is a form that occurs early in life (early childhood) and demonstrates rapid local enlargement. Treatment of ossifying fibroma requires an attempt at complete removal to reduce the chances of recurrence. Osteomas are tumors with normal bony architecture. They commonly involve the anterior cranial fossa with a predilection for the frontal sinus, where they can obstruct mucociliary flow. Osteomas are composed of a central area of cancellous bone surrounded by a layer of compact bone and tend to be well demarcated. Osteoblastomas differ in that they demonstrate faster growth in younger patients and usually produce more pain than osteomas. They most often originate in the maxilla. Meningiomas comprise approximately 15% of all intracranial tumors. They are well delineated and rarely metastasize. Locally, they spread along planes of least resistance such as the dural layers. Meningiomas extend into bone by growing into haversian canals rather than by bone erosion; therefore, reactive bone formation is a common finding. Meningiomas are comprised of dense fibrous tissue and tend to be hypervascular. Most skull base lesions are found along the petrous temporal bone or the infratemporal surface of the greater sphenoid wing and occasionally in the olfactory groove. Angiofibromas are composed of dual neoplastic elements, consisting of a dense fibrous mass interlaced with variable amounts of thinly walled endothelial-lined vascular spaces. These lesions are exclusively found in adolescent boys and originate in the mucosa around the sphenopalatine foramen, from where they enlarge to present as nasopharyngeal masses with extension into the paranasal sinuses, orbit, pterygomaxillary space, and cavernous sinus. Patients who have angiofibromas usually first present with sinonasal symptoms and epistaxis. Although their growth eventually ceases with adolescence, they can quickly reach very large proportions and compress adjacent structures. The primary modality of treatment is surgical resection, although antiandrogenic hormonal treatment and radiation therapy have been described for selected cases. Paraganglia are derived from neural crest cells of the dorsal root ganglia and are distributed widely throughout the head and neck with the highest concentration being found in near the carotid sheath. Head and neck paraganglia closely resemble carotid bodies and are comprised of 2 cell types: granule-storing chief cells and Schwannlike satellite cells. Tumors of the internal jugular vein paraganglia (glomus jugulare) and the vagus nerve (glomus vagale) are the most common lesions involving the skull base, although glomus tumors may rarely arise in paraganglia of the orbit and nasopharynx. Surgical therapy is the principal form of therapy; however, because these are relatively slow-growing lesions, observation or radiation therapy may be used in nonoperative candidates or in those cases where surgical resection carries a significant morbidity secondary to multiple CN deficits. A variety of vascular neoplasms and malformations can affect the skull base. Hemangiomas are true neoplasms and can be capillary, cavernous, or mixed form, depending on the type of blood vessels present in the lesion. They proliferate rapidly after birth and then gradually shrink during childhood. Involvement of bone is uncommon. Hemangiomas of the skull base most commonly involve the orbital apex, where they affect vision by compression of the optic nerve or structures passing through the superior fissure. Malformations can be arterial, venous, or arteriovenous in type. They are thought of as developmental anomalies that are not evident at birth but that gradually grow during childhood. Vascular tumors and malformations can be categorized as low flow or high flow depending on the degree of blood traveling through them. High-flow arteriovenous malformations can lead to severe circulatory compromise. Options for treatment of vascular tumors include embolization, sclerotherapy, or resection. Aneurysms are abnormal dilations of intracranial vessels and most commonly involve the skull base at the sellar and parasellar regions. Small lesions can be observed, but larger ones warrant surgical intervention because they carry a significant risk of rupture. Benign tumors of the skull base tend to be relatively slow-growing lesions that manifest clinically by producing symptoms related to compression and dysfunction of vital structures in the local area of growth, particularly as related to CN deficits, sinonasal function, vision, and hearing. Headache is a nonspecific finding common to many tumor masses of the skull base. Nasal obstruction, sinusitis, and anosmia suggest a tumor of the anterior cranial base. Proptosis, diplopia, or visual loss indicates involvement of the orbit or optic chiasm. Cavernous sinus disease usually manifests initially with dysfunction of the motor supply to the globes (CNs III, IV, VI) and resultant dysconjugate eye movements. Sensory deficits of the face or oral cavity herald involvement of the divisions of CN V by a tumor of the middle cranial base, likely with disease in the infratemporal fossa and/or the pterygopalatine space. Tumors of the posterior cranial base tend to produce otologic symptoms, facial nerve dysfunction, or deficits of the posterior CNs (IX-XII). The treatment of choice for the vast majority of benign skull base tumors is surgical excision. The skull base can be divided into regions correlating with the major intracranial fossa. The middle skull base relates to the middle cranial fossa. The osseous anatomy consists of the squamous temporal bone, petrous temporal bone anterior to the petrous ridge, greater wing of the sphenoid, and the lateral portion of the occipital bone. Associated intracranial structures include the temporal lobes, lateral aspect of the cavernous sinus, and the greater superficial petrosal nerve. Contained within the bony plate of the middle skull base are the vertical and horizontal segments of the petrous internal carotid artery. Extracranial structures include the temporal fossa, infratemporal fossa, paranasopharyngeal space, and masticator space with all of the muscular, neurovascular, fibrous, and cartilaginous elements contained within these complex regions. Common benign tumors include juvenile angiofibromas, neuromas, meningiomas, hemangiomas, and salivary benign mixed tumors. The posterior skull base relates to the posterior cranial base. Osseous anatomy consists of the petrous temporal bone posterior to the petrous ridge and occipital bones. Medially, the space extends to the foramen magnum and, laterally, to the mastoid temporal bone. Associated intracranial structures include the cerebellum, lateral pons, cerebellopontine angle, and sigmoid and petrosal venous sinuses. Extracranial structures include the internal jugular vein, vestibulocochlear labyrinth, and middle and external ear contents. Common benign tumors are acoustic schwannoma, glomus tumors, meningiomas, and petrous cholesteatomas. Other classifications consider the central skull base as part of the middle and/or the anterior skull base; however, it has unique features that justify a separate category. Located in the midline between the right and left middle cranial fossa and posterior to the anterior fossa, the central skull base corresponds to the region of the brainstem and the pituitary gland. 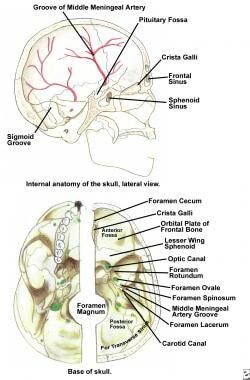 Bony anatomy includes the sella turcica, body of the sphenoid, anterior clinoid process, posterior clinoid process, and the lateral and posterior walls of the sphenoid sinus. Intracranial structures include the ventral surface of the brainstem, basilar artery, pituitary gland, intracranial optic nerves, the optic chiasm, and the medial aspect of the cavernous sinus. The cavernous sinus is a complex dural space filled with blood and is located lateral to the sphenoid sinus and sella. It contains the internal carotid artery, occulomotor nerve, CN IV, abducens nerve, and the first and second division of the trigeminal nerve. Extracranial structures include the sphenoid sinus and nasopharynx. Tumors involving the central skull base are pituitary adenomas, craniopharyngiomas, chordomas, and juvenile angiofibromas. The skull base is a highly complex region with multiple bony foramina through which pass several important neurovascular structures as outlined below. Palme CE, Irish JC, Gullane PJ, Katz MR, Devins GM, Bachar G. Quality of life analysis in patients with anterior skull base neoplasms. Head Neck. 2009 Jun 17. [Medline]. O'Malley BW Jr, Grady MS, Gabel BC, Cohen MA, Heuer GG, Pisapia J, et al. Comparison of endoscopic and microscopic removal of pituitary adenomas: single-surgeon experience and the learning curve. Neurosurg Focus. 2008. 25(6):E10. [Medline]. Gui S, Zong X, Wang X, et al. Classification and surgical approaches for transnasal endoscopic skull base chordoma resection: a 6-year experience with 161 cases. Neurosurg Rev. 2016 Feb 3. [Medline]. Mansouri A, Klironomos G, Taslimi S, et al. Surgically resected skull base meningiomas demonstrate a divergent postoperative recurrence pattern compared with non-skull base meningiomas. J Neurosurg. 2016 Jan 1. 1-10. [Medline]. Tanaka S, Pollock BE, Stafford SL, Link MJ. Stereotactic radiosurgery for trigeminal pain secondary to benign skull base tumors. World Neurosurg. 2012 Feb 10. [Medline]. Ramina R, Mattei TA, Sória MG, da Silva EB Jr, Leal AG, Neto MC, et al. Surgical management of trigeminal schwannomas. Neurosurg Focus. 2008. 25(6):E6; discussion E6. [Medline]. Kryzanski JT, Annino DJ, Gopal H, Heilman CB. Low complication rates of cranial and craniofacial approaches to midline anterior skull base lesions. Skull Base. 2008 Jul. 18(4):229-41. [Medline]. Chisholm EJ, Mendoza N, Nourei R, Grant WE. Fused CT and angiography image guided surgery for endoscopic skull base procedures: how we do it. Clin Otolaryngol. 2008 Dec. 33(6):625-8. [Medline]. Gilbo P, Morris CG, Amdur RJ, et al. Radiotherapy for benign head and neck paragangliomas: A 45-year experience. Cancer. 2014 Jul 24. [Medline]. Ransom ER, Doghramji L, Palmer JN, Chiu AG. Global and disease-specific health-related quality of life after complete endoscopic resection of anterior skull base neoplasms. Am J Rhinol Allergy. 2012 Jan. 26(1):76-9. [Medline].